We’d love your help. Let us know what’s wrong with this preview of Blessings by Anna Quindlen. To ask other readers questions about Blessings, please sign up. Any body else finding the cavalier approach by Skip in taking care of a newborn a bit unplausible? I can see there is another posted comment, but I didn't open it because its marked as a spoiler alert. I've like other books by Anna Quidlen, so I'm going to be disappointed if this turns out to be a sappy plot. Anne Not at all sappy. Late one night, a teenage couple drives up to the big white clapboard home on the Blessing estate and leaves a box. In that instant, the lives of those who live and work there are changed forever. Skip Cuddy, the caretaker, finds a baby girl asleep in that box and decides he wants to keep the child . . . while Lydia Blessing, the matriarch of the estate, for her own reasons, agrees to help him. "Blessings" explores how the secrets of the past affect decisions and lives in the present; what makes a person or a life legitimate or illegitimate and who decides; and the unique resources people find in themselves and in a community. This is a powerful novel of love, redemption, and personal change by the Pulitzer Prize-winning writer about whom "The Washington Post Book World" said, "Quindlen knows that all the things we ever will be can be found in some forgotten fragment of family." I loved every minute in the company of these characters and the beautiful old place called Blessings. This book was a selection for my daughter's book club. Let me say straight off that I loved it! A baby is left by the garage of the local "big house" by a couple of teenagers, and found by the handyman who lives over the garage. A strange complicity develops between him and the house's owner, and two people from opposite sides of the social divide enter into a friendship that reconciles their own pasts. So now I'm going to talk about the rules it breaks. You get a lot of talk on writer blogs abou This book was a selection for my daughter's book club. Let me say straight off that I loved it! So now I'm going to talk about the rules it breaks. You get a lot of talk on writer blogs about never starting your novel with a backstory dump: Blessings sets up the action and then gives you 70 pages of backstory before the story moves forward. You're told to use short, punchy sentences. Blessings is strewn with long and sometimes somewhat clunky sentences. So why does it work so well? The answer has to be that the writing is beautiful, the characters are immaculately drawn and very convincing, and the setting gets just enough--but not too much--attention. It struck me that the main story is in fact quite slight, and that without the backstory setup I'd probably be thinking "so what?" as it gets going. But by the time the action gets going, I was so thoroughly invested in the lives of the characters that I devoured the rest of the book. She was an old bat who lived alone in a crumbling mansion and she had gone seventy-five years without a man. During the first seventy-three years she had lived alone, but now that she was too old to mow her own lawn and wash her own socks a boy lived with her. "Boy," said Lydia Blessings. "I hear a baby crying. Go and bring him into our house, so I may vicariously enjoy the thrill of motherhood." "Yes, boss lady." The boy was thirty-seven years old, and he was not really a boy, but the old woman was rich and the boy knew his place. In the nights the baby cried often and the old woman liked to hear it because it meant that someone else was changing the diapers and breathing in the foul baby-stink which she could never have endured. "Ha ha," thought the old bat, "for so many long centuries men have forced women into making babies and changing diapers. Now I will force the young man who knows his place to do all the woman's work for me. Ha ha ha ha ha ha!" The young man did not like changing the baby's diapers, but he was a poor, weak-willed young man who was not smart, not rich, not directed enough for college. He changed the baby's diapers often and over time began to discover that he truly hated the old bat and the baby. I found this on a free pile of books and thought the title vaguely intriguing. Free appeals, and I seemed to recall that I'd read Black and Blue once -- same author -- and liked it. This novel is soothing, yes it is, but it's a bit trite, and there is only one, just one, really sharply depicted poignant moment late in the narrative (where the hero has suffered a tremendous loss) which is so well-done I was left openmouthed; also, there is a charming enjoyable assessment of Agatha Christie books. I found this on a free pile of books and thought the title vaguely intriguing. Free appeals, and I seemed to recall that I'd read Black and Blue once -- same author -- and liked it. This novel is soothing, yes it is, but it's a bit trite, and there is only one, just one, really sharply depicted poignant moment late in the narrative (where the hero has suffered a tremendous loss) which is so well-done I was left openmouthed; also, there is a charming enjoyable assessment of Agatha Christie books. That's not enough. But the tone, as I say, is soothing, and the farmhouse location on plenty of nicely tended land is bucolic and calming. I could have taken a pill for quicker and more satisfying effect. When a baby is abandoned at Blessings, a rural country estate, it is up to the ex-con groundskeeper, the crotchety old woman who owns Blessings, and the daughter of the Korean housekeeper and the local garage owner to take care of her. Blessings is a story about the skeletons in our closets, and every mistake helps us to become the people we are today. Anna Quindlen is one of those authors who holds the power to knock the socks off of me. Every time I go to pick up one of her books I know that, at some point, I’m going to end up in tears – so I have to pace myself accordingly. Blessings was no different. While it didn’t contain nearly the same amount of tragedy some of Quindlen’s other books have (Yes, Every Last One, I’m looking at you), it still had some heartbreaking moments, but, in true Quindlen style, I knew that these characters would be strong enough to overcome it. Blessings is the story of a family, an unlikely family, but complete with all of the past wrong-doings, mistakes, loves and hurts that a “normal” family might have. This family consists of a Korean housekeeper, an 80ish year old woman, and a convicted felon groundskeeper… and one tiny, helpless baby. Of course, there is also the house, which is filled with history and memories and can’t be left out of the mix. I was completely charmed by Charles “Skip” Cuddy and his treatment of the unlikely turn of events that culminated in his finding a baby in a box on the steps of “his” barn. I held my breath through each hurdle and ached for him as he learned the correct way to care for the child, and, when the end came (as it always does in these types of stories), my heart ached for him. Pulitzer Prize–winning ANNA QUINDLEN is such a wonderful writer that she is listed as one of my favorites. Her prose is just lovely. Washington Post Book World said, “Quindlen knows that all the things we ever will be can be found in some forgotten fragment of family.” I concur. She really captures both place and characters. BLESSINGS is a powerful novel of personal change, redemption, and love. The growth in her immaculately drawn characters is well-developed and believable. I cared so deeply a Pulitzer Prize–winning ANNA QUINDLEN is such a wonderful writer that she is listed as one of my favorites. Her prose is just lovely. Washington Post Book World said, “Quindlen knows that all the things we ever will be can be found in some forgotten fragment of family.” I concur. She really captures both place and characters. BLESSINGS is a powerful novel of personal change, redemption, and love. The growth in her immaculately drawn characters is well-developed and believable. I cared so deeply about them and their circumstances that despite the well thought out and realistic resolutions to their problems I did not want the book to end. I want a sequel, with the same characters, yet I know any of this gifted author's characters in her future writings will be equally loved by her readers. This would make an excellent book club read and discussion. It would also make a great movie. I "read" the audio version, expertly narrated by JOAN ALLEN, it was a delight. I enjoyed it so much I've requested the hard bound version from my library. I really enjoyed this book. I love how the woman keeps on having flashbacks of her past. there are a lot of really well written lines in this book as well. The actual story isn't half as good as the brief glances off the past. Reading this book made me treasure my memories that much more, the good and the bad. I recommend this book to everyone. This quiet, somewhat controversially-evocative novel touched me in so many diverse ways. Quite unexpectedly, I might add. A foundling baby girl, two strung-out college kids, an ex-con, derelicts, an elderly reclusive heiress, an immigrant domestic and her daughter..... Character driven and atmospherically transporting. So subtly rich. And frankly, because of the books diverse redolence, I find it challenging to properly categorize it, precisely. In some ways, BLESSINGS is character studies in parallels: elderly and the young; wealthy and poor; male and female; cosmopolitan and country; socialites and recluses; generations - then and now. Yet, in other ways, BLESSINGS is all the many facets of family: traditional, unconventional, dysfunctional, blended, and all the quirks, skeletons, conventions, misconceptions, expectations, eccentricities, affections, and nuances that go hand-in-hand with every family and tribe since the beginning of time. Every family tree has its share of blights, nuts, crows, and such; some, more than others. And others, more than some - though selectively camouflaged. Another element at play is the title itself. BLESSINGS. So many elements surrounding the attributes of blessings - grace, favor, protection, redemption, intercession, unconditional love - evolve as the story slowly unfolds, at times, in an ebb-and-flow stream of memories, or like an avocado peeled, layer by layer. The surface characteristics of a person are not necessarily the same as what's at the core of a person's true self. Making the point quite well: judge not. The hardest, coldest exteriors can contain the warmest hearts. Sometimes they just need a jolt for thawing. And one's upbringing, and or environment, doesn't necessarily determine the course of one's life; particularly not when offered a blessing. Note: Contains a brief amount of expletives. I like this author but almost didn't read the book because of the title. I was in a hurry, getting ready for a trip & needed an audio for the car, so decided to grab it anyway. It was fragile, succinct & thought provoking. The appearances we keep, the moments we miss, the happiness we deny ourselves...all for the sake of what is right when we might have opted for instead what is good. The story of little Faith and Skip Cuddy is worth the read. Oh, to be loved so. Great characters. Interesting story. I already miss everyone. 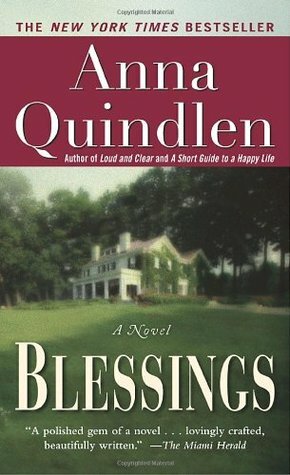 Blessings is an antiquated estate belonging to the elderly descendant Lydia Blessing, and attended to by her contentious housekeeper, Nadine, and newly-hired groundskeeper Skip Cuddy. Life at Blessings revolves around the routine and social etiquette of a by-gone era, which Lydia refuses to move beyond. When Skip discovers an abandoned newborn child on his literal doorstep, he inexplicably chooses to keep the baby. 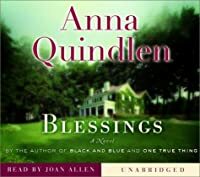 He was only recently released from a jail sentence for being at the wrong place Blessings is an antiquated estate belonging to the elderly descendant Lydia Blessing, and attended to by her contentious housekeeper, Nadine, and newly-hired groundskeeper Skip Cuddy. Life at Blessings revolves around the routine and social etiquette of a by-gone era, which Lydia refuses to move beyond. When Skip discovers an abandoned newborn child on his literal doorstep, he inexplicably chooses to keep the baby. He was only recently released from a jail sentence for being at the wrong place at the wrong time, so he does his best to make sure no one knows of her existence, lest she be taken from him. Unfortunately, or so it seems at first to the naïve Skip, Lydia happens upon the child, and thus begins a complicated partnership to keep baby Faith prospering, and a secret. Blessings was a mixed blessing to read. The beginning of the book moved slowly, much of the narrative used to characterize the Blessing estate. It might serve well for a lengthy introduction in a movie, but in prose, it was tedious. Passages waxed beautifully poetic at times, whereby I am certain it garnered much of its literary kudos, and for those, I would agree. Had I not been given the book and heard good reports of it, and had instead picked it up in a store and read the first few pages, in truth, I doubt I would have chosen to read it. I waded through several chapters before the storyline developed a satisfactory hold on me, and while the book was overall well-written, I marveled at its characters. The male protagonist, Skip Cuddy, is a down-and-out anti-hero, whose cluelessness borders on the unfathomable. I empathized with his desire to not have a sweet, innocent infant be thrust into bureaucratic machinery that would spit it out into what would all-too-likely be substandard care. He never once gives thought as to how the child will integrate legally into the world without a birth certificate and social security number, things that to him seem to be of no priority, as if she can merely be a phantom in the system, an illegal alien. Lydia Blessing is also problematic. Her determination to remain in the past, despite forays into the real-time world, seems delusional at best. She understands the exigencies of living in modern times. She takes steps to initiate making the abandoned baby a legitimate person, but does so as part of a bizarre subterfuge that is beneath her obvious intellect. The storyline is a solid one, embroidered with appropriate emotion and turmoil, weaving together disparate lives and personalities. I just wish the narrative had been more actionable in concert with its lusciousness. I like this quiet, gentle, sweet book; the two main characters are a bit world-weary, having experienced harshnesses in life such that they don't take good for granted. They don't know each other at the outset of when this book is set; a baby is dropped off and they rebel at first individually, but for both it is a perfect element in their lives. And so far their fears prove unfounded and life is unfolding in its own, sweet way. Reminds me a bit of Margaret Atwood's 'Bean Trees', only that was m I like this quiet, gentle, sweet book; the two main characters are a bit world-weary, having experienced harshnesses in life such that they don't take good for granted. They don't know each other at the outset of when this book is set; a baby is dropped off and they rebel at first individually, but for both it is a perfect element in their lives. And so far their fears prove unfounded and life is unfolding in its own, sweet way. Reminds me a bit of Margaret Atwood's 'Bean Trees', only that was much, much more difficult to get in to. Lovely.. I also really like how, for the older woman (who owns the estate where the baby was left), time is fluid and the past is present; some times she'll have a conversation with someone in the present moment, interspersed with a self-conversation about the past, or a conversation with someone from the past, or a conversation replay, etc.. Works for me. Seems like this could make a great film. Finished it - so sad! But very excellent. Sitting and stewing about the way things ended up going, I guess it is good in many ways; and leaves many good open doors for the favorites to go through in the future. A sequel or semi-sequel etc.. would be delightful, Skip is such a dear character. A lovely book. Ms Quindlen's writing style is reminiscent of that of one of my favourite authors Rumer Godden. The plot is a framework for character development, and both plot and characters slowly open like a flower. Corny, I know, but hypnotic & beautifully done. The basic plot is simple: town loser finds abandoned baby & falls in love with baby, cranky rigid old lady who is his employer becomes a part of the conspiracy to keep the baby a secret, and, yes, there is a girl. Around this f A lovely book. Ms Quindlen's writing style is reminiscent of that of one of my favourite authors Rumer Godden. The plot is a framework for character development, and both plot and characters slowly open like a flower. Corny, I know, but hypnotic & beautifully done. Maybe it's just some personality defect on my part, but Anna Quindlen kind of bugs me. I never got into her columns, and I wasn't crazy about her novel, "Black and Blue." And anyone who has the chutzpah to publish a book of "life secrets" that's only 64 pages -- and to charge $12.95 for it -- is someone I don't want to know very well. That said, I thought "Blessings" was an okay book. Not terrific, but worth a read if you're 3,000 miles from home and don't have a lot of other choices (which was Maybe it's just some personality defect on my part, but Anna Quindlen kind of bugs me. I never got into her columns, and I wasn't crazy about her novel, "Black and Blue." And anyone who has the chutzpah to publish a book of "life secrets" that's only 64 pages -- and to charge $12.95 for it -- is someone I don't want to know very well. Skip is working hard as an overall handyman for Lydia Blessing, after a spot of trouble with the law, basically due to keeping the wrong company. One morning Skip discovers a cardboard box near the garage where he is living. He discovers an abandoned newborn baby girl. He decides that if he was to report the find it would make the child's life into a circus so he therefore decides to keep the baby and care for it himself. Babies tend to change things in the lives they touch and this baby is no exc Skip is working hard as an overall handyman for Lydia Blessing, after a spot of trouble with the law, basically due to keeping the wrong company. Babies tend to change things in the lives they touch and this baby is no exception. I actually enjoyed this book, including the ending. It was an easy read with a back story that was brought out in a believable way throughout the book. I really liked the main characters but felt the weakness of the bookk was that I never really got to know the supporting characters. Wonderful! much less 'dark' than some of her other books I have read. Great characters. 3.75 stars. This book was written some time ago, but so glad I picked it up as a summer read. In Blessings, we meet an array of characters. We first meet Lydia Blessing, eighty year old matriarch and sole resident of “Blessings”, the family estate. Skip Cuddy, a young man who was down on his luck is her newly hired grounds caretaker. As Skip works long hard hours, he comes across a box left on the property with a baby inside. Rather shocked and taken by what he found, he decides that he should c 3.75 stars. This book was written some time ago, but so glad I picked it up as a summer read. In Blessings, we meet an array of characters. We first meet Lydia Blessing, eighty year old matriarch and sole resident of “Blessings”, the family estate. Skip Cuddy, a young man who was down on his luck is her newly hired grounds caretaker. As Skip works long hard hours, he comes across a box left on the property with a baby inside. Rather shocked and taken by what he found, he decides that he should care for this baby, all while trying to hide this fact from Lydia. She soon finds out, and decides to help him. As the story moves along, Lydia finds herself reflecting and reminiscing on her own past~ both fond memories and a few regrets. What makes a family a family? This is the basis of this story. When Skip Cuddy finds an abandoned newborn on the Blessings property, he wants to keep it. Hiding the child away as he goes about his job as caretaker of the property. His employer, the elderly Lydia Blessing, wants the same thing (when she finally discovers the baby) and is willing to help him keep the child he names Faith. They all become a family of sorts even as secrets are kept, discovered, and shared. An okay story with moments o What makes a family a family? This is the basis of this story.